Increasing numbers of children are being treated for malaria and malnutrition in southern Niger compared to one year ago. An MSF nurse inserts an IV drip for a malnourished child in Guidan Roumdji, where the populace is facing a peak of malaria and malnutrition. MADRID/NEW YORK, APRIL 25, 2013—Increasing numbers of children are being treated for malaria and malnutrition in southern Niger compared to one year ago, suggesting that 2013 may see higher peaks of the two diseases than in previous years, the international medical humanitarian organization Doctors Without Borders/Médecins Sans Frontières (MSF) warned in a report released today. With the rainy season approaching, and more cases of malnutrition and malaria expected, an integrated approach to preventing and treating malaria and malnutrition together is essential in order to stave off another crisis. Malaria and malnutrition are closely related. The months of the "hunger gap," when malnutrition is at its peak, coincide with the rainy season, when mosquitoes breed and malaria cases increase dramatically. The diseases combine in a vicious cycle: malnourished children have weakened immunity, making them susceptible to malaria, while children sick with malaria are more likely to become dangerously malnourished. Last year's malaria peak led to more than 3,000 deaths in Niger. A retrospective mortality survey carried out by MSF in the districts of Madaoua and Bouza showed that deaths among children under five were at three times the emergency threshold, with malaria accounting for more than half of the deaths. The peak also caused a sharp increase in the number of children admitted to hospital with severe malnutrition. Over recent years, strategies for combating malnutrition have shifted to include prevention in addition to treatment. A similar approach can be applied toward fighting malaria. MSF plans to implement a new malaria prevention strategy known as seasonal malaria chemoprevention (SMC) in Niger's Madaoua district this year. The strategy involves pre-emptively providing a full course of antimalarial treatment to children at intervals during the peak malaria season, from July to October. MSF successfully used this strategy in Mali and Chad in 2012. Malaria prevention must be integrated into basic health measures aimed at all young children in Niger, MSF said. MSF carried out a number of activities in Niger in 2012 aimed at improving access to health care for children under five and for pregnant women. Medical teams in the regions of Zinder, Maradi, and Tahoua run outpatient feeding programs in some 37 health centers. Severely malnourished patients requiring hospital care were admitted to inpatient feeding centers in Zinder, Magaria, Madarounfa, Guidan Roumdji, Madaoua, and Bouza. 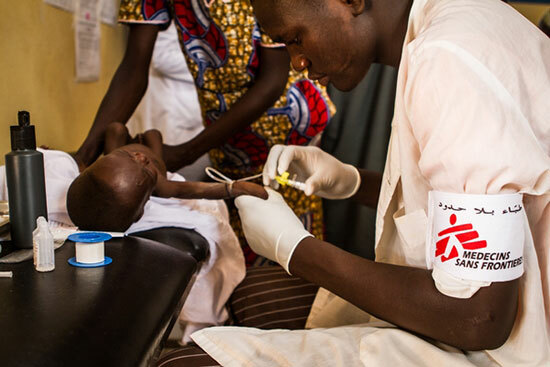 In 2012, more than 90,000 children with acute malnutrition and 390,000 children with malaria were treated in medical facilities managed by MSF and its partners.